Surely you have heard of famous anime? This is a franchise like Naruto, Dragon Ball, or even Attack on Titan that people know of even if they don’t read manga or watch anime. If you never heard of it, which is doubtful, you might be wondering why it’s famous among Americans. A good look at the source material shows us why. My Hero Academia is set in a world where everyone is an X-man: they all have a power they were born with. And with these powers, everyone can become a superhero – or a villain – if they want to. Well, everyone except Izuku “Deku” Midoriya. Despite being born without a Quirk, he plans to live up to his hero, the strongest man All Might who always saves everyone with a smile. In fact, while trying to get his autograph, Deku finds out that All Might was born without powers too, but was given a special kind of power that could be transferred to others. Deku uses that skill to win a spot at the hero training academy high school. But his trials are not over as he faces old and new classmates, class battles, and tests of whether he can be a true hero. Why do Americans like this manga? Superheroes. Like I have said earlier, the idea of powers makes it seem like X-Men, and All Might looks like the surfer version of Superman. Additionally, while some of these powers, called Quirks, are the familiar to comic readers, such as turning invisible, there are new and unique quirks that the author created, such as the power to use both fire and ice. The characters are also very easy to distinguish, with fun character designs, such as a girl who is literally invisible all the time or a girl who has a frog like power, and thus looks like a very cute frog. Finally, a main point to be made are the villains. Not only do they make the characters think about themselves, but they are just as awesome as the heroes. They have amazing powers, and one of the villains has a hand on his face the whole time. Even though I don’t care for superheroes all that much, I do love how the author writes the story, and if you are interested in superheroes this one is for you. Boku no Hero Academia by Kohei Horikoshi is available for checkout from the Mission VIejo Library. 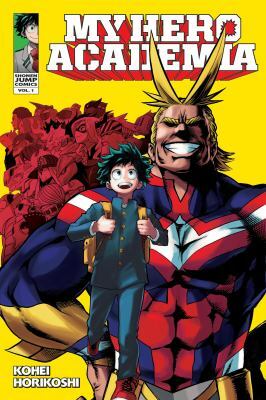 This entry was posted in Book Reviews, Manga Reviews and tagged action, boku no hero academia, comedy, high school, manga, my hero academy, quirks, super powers, superheroes by Megan V.. Bookmark the permalink.